Arc34 Uses continuous Fiberglass and Chopped Carbon Fiber to manufacturing end use GoPro mounts. Their low volume and high strength requirements make Markforged printers a perfect option. 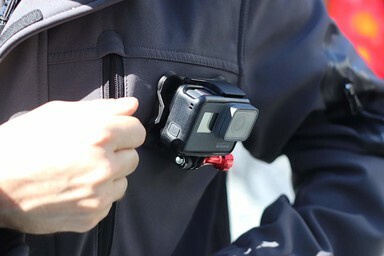 Arc34 developed the PDQ Mount, a magnetic GoPro mount built to perform in all weather and environments. Their device has to be strong and secure enough to protect the camera even when speeding down ski slopes or immersed under water. Early iterations used sheet metal, ABS, and PLA for the enclosure and bracketry, but none proved to be ideal. Markforged’s Onyx selectively reinforced with continuous fiberglass is the only material to succeed in real-world conditions without prohibitive cost or fabrication constraints. Co-founder Brad Hess says it is “the perfect solution to actually take the product to market. There’s nothing else price point- and quality-wise” and there have been “zero returns due to defect”. Arc34 now turns to their “workhorse” Markforged 3D printer at every stage between initial concept and going to market. It runs 24/7, printing various different parts with minimal human oversight, and allowing remote kickoff of new builds via Markforged’s integrated software. When it’s not making PDQ Mount components, their printer produces new iterations of prototypes for clients. These parts allow Arc34 to validate not only fit, form, and design, but also fundamental principles of function.